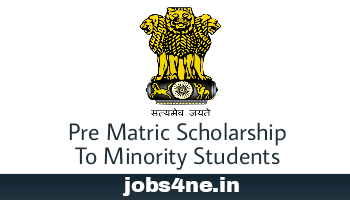 Pre-Matric Scholarship to the Notified Minority Communities' Students for the Year 2017-18. - Jobs4NE : Jobs in Assam and North East India. Pre-Matric Scholarship to the Notified Minority Communities' Students for the Year 2017-18. Fresh and Renewal applications under Pre-Matric Scholarship scheme for the year 2017-18 are invited through Online from the students of notified minority communities studying in Class I to Class X. From 2017-18, the online implementation of Pre-Matric Scholarship scheme will be done through National Scholarship Portal (NSP) of the Government of India under URL www.scholarships.gov.in. A link to the site is also made available in the website of the Ministry of Minority Affairs i.e. www.minorityaffairs.gov.in. The detailed guidelines of the Scholarship Scheme and the standard operation procedure with the timelines is available on the National Scholarship Portal (NSP). Only online application under the scheme will be accepted and no request for offline applications will be entertained. Before applying online students are advised to read the guidelines and FAQs available on the website. 1. Submission of Online applications 1st June to 31st for Fresh scholarship by students August, 2017. 2. Submission of Online applications 1st June to 31st for Renewal scholarship by students July, 2017. The Bank Account Number of applicants must be in his/her name. The Bank Account Number, IFSC etc must be correctwhile applying online. i) Pre-Matric Scholarship will be awarded to the students of Class I to Class X who have secured not less than 50% marks in the previous final examination and annual income of their parents/guardian from all sources does not exceed Rs. 1 lakh. Scholarship will not be given to more than two students from a family. ii) 30%of scholarship will be earmarked for girl students. In case sufficient number of eligible girl students are not available, then the balance earmarked scholarships may be awarded to eligible boy students. The student obtaining benefits under this scheme shall not be allowed to avail of benefits under any other scheme for this purpose. It is mentioned here that, the institutional Head will keep the Online application (Hard copy) along with supporting documents from the students. After receiving Online applications from the students they will login to the Institute and verify/ approve the Online applications. For more details visit the website www.scholarships.gov.in and www.minorityaffairs.gov.in.